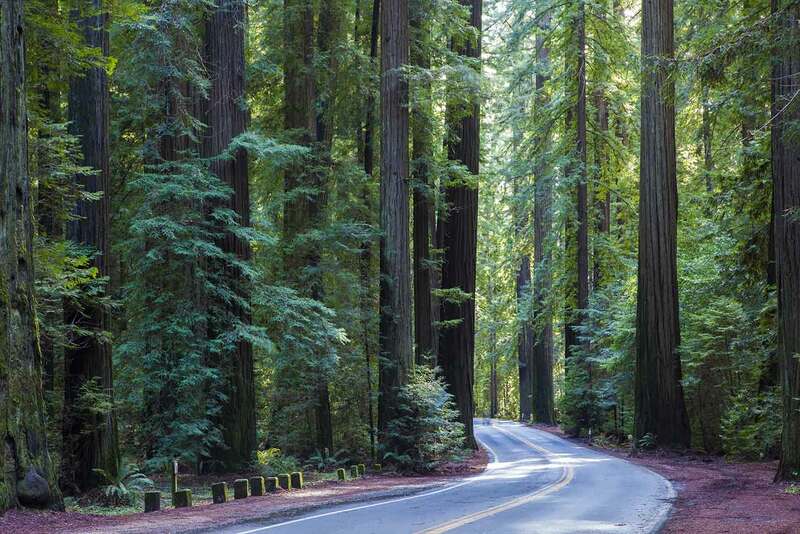 Between 1909 and 1923, the Redwood Highway was built as part of a new statewide highway system. The road, together with the strong 1920s economy, accelerated logging of the previously-remote Eel River valley. In 1917, three natural scientists from San Francisco drove up the Redwood Highway and into Bull Creek Flats to investigate the extent of the logging (see this fascinating 1919 account of a follow-up trip). 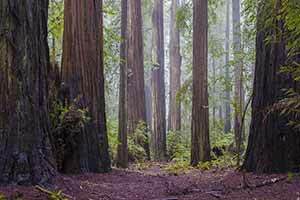 Dismayed at the rapid destruction of the magnificent roadside groves, they started the Save-the-Redwoods League, which quickly became the foremost organization devoted to preserving North Coast redwoods. 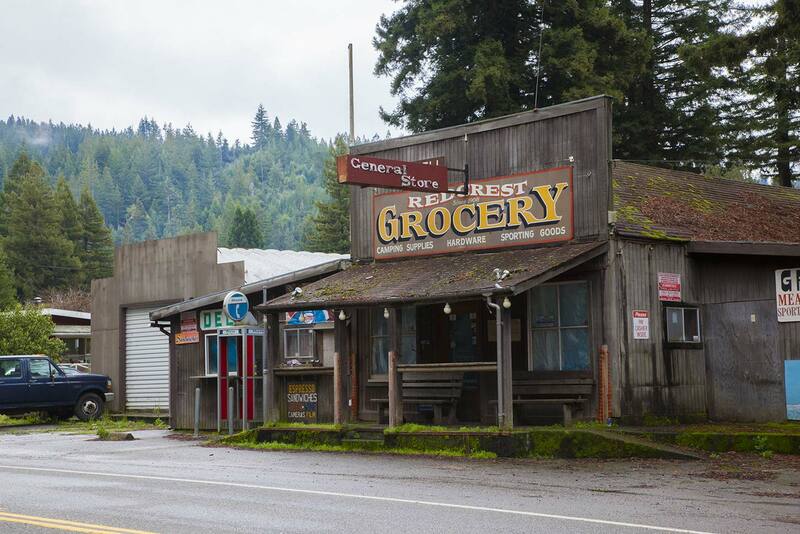 Relations between preservationists and timber companies were mostly good at that time, and the League soon purchased pristine groves in the future Prairie Creek and Del Norte parks. 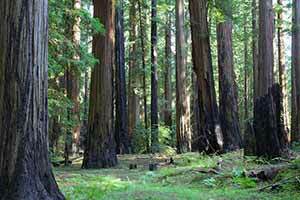 However, Pacific Lumber, the biggest owner of the future Humboldt Redwoods parkland, was not willing to sell. 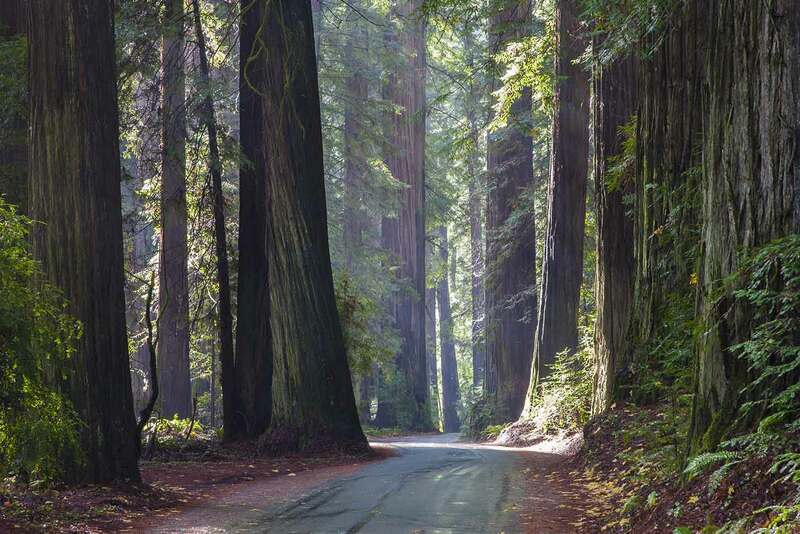 With the incomparable groves along the Redwood Highway being rapidly logged, in 1924 the League convinced Humboldt County to use its power of eminent domain to acquire the old-growth groves along Bull Creek and the Eel River. Despite matching funds provided by the state, the acquisition was not free and relied on donations from private citizens whose names now adorn numerous plaques throughout the park. 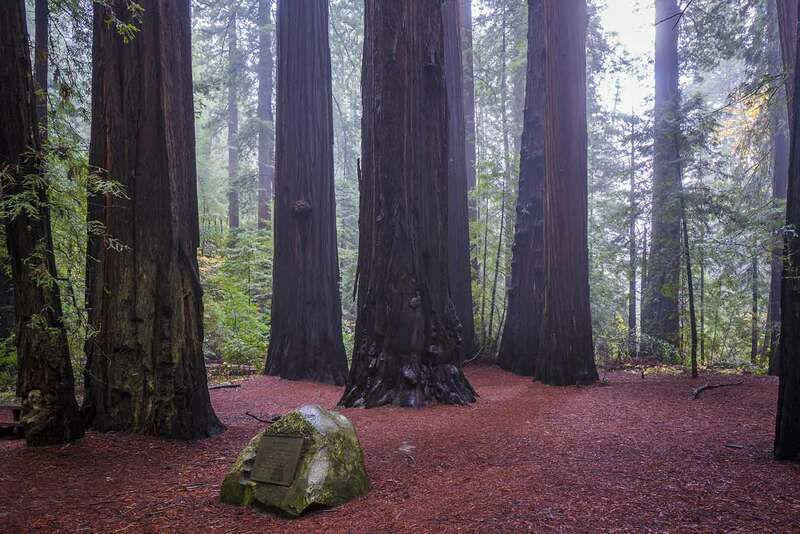 Most notably, John D. Rockefeller donated $1 million to purchase Bull Creek Flats and the Founders’ Grove, which today is the largest contiguous stretch of old-growth redwoods in the world. The slopes above Bull Creek remained opened to logging, and clearcutting during the post-World War II construction boom lead to catastrophic floods in 1955 and again in 1964. 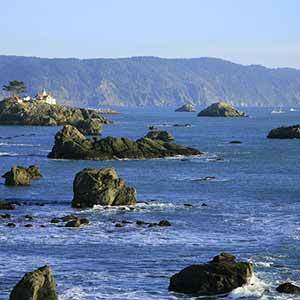 Also in 1955, construction began on Highway 101. This four-lane freeway was originally going to pass through the most scenic portion of each North Coast redwood park. 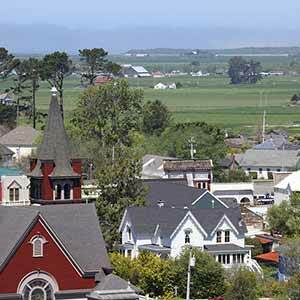 The League couldn’t stop the freeway from passing through the Eel River Valley, but did at least convince the Highway Commission not to bulldoze the Founders’ Grove. 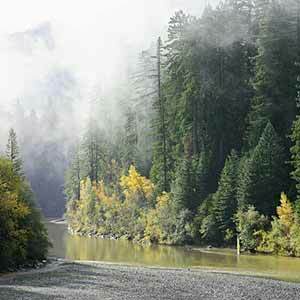 As built, the freeway mostly skirts Humboldt’s old-growth redwoods, but the traffic noise still permeates the groves along the Eel River. Despite the traffic noise, the logged groves, and the limited old-growth hiking, Humboldt Redwoods today is a absolute must-see for anyone interested in redwoods. 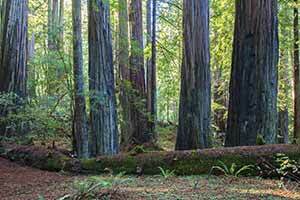 Bull Creek Flats in particular remains matchless for its serene cathedral-like groves, which have a dark, stately character unlike any other redwood park. The Avenue of the Giants is at its best to the north of Founders’ Grove, where a lush landscape of impressive redwoods lines the road. This little grove features a network of unofficial trails that cut through an extraordinarily plush carpet of redwood sorrel. One of the highlights of Humboldt Redwoods. Adjacent to the Grieg-French-Bell grove, this trail also has extraordinarily lush sorrel groundcover, especially near the trailhead. Further in, the sorrel is not as plush but there are some large redwoods. This trail runs through some very nice redwoods next to the Avenue of the Giants. 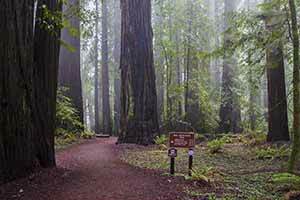 The best redwoods are near the parking area at the north end of the trail. This trail, also known as the Five Allens Trail, climbs steeply through uninteresting redwood uplands but eventually reaches a little valley that shelters an attractive redwood grove. This grove has an unusually prominent parking area on the Avenue of the Giants, but the grove itself is actually pretty dull, with no big trees or noteworthy sights. The best part is an unofficial trail that leads to an attractive little glen. 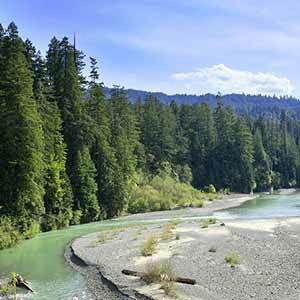 The best and most unspoiled part of Humboldt Redwoods, the large alluvial flat of Bull Creek has some of the world’s most impressive redwood groves. 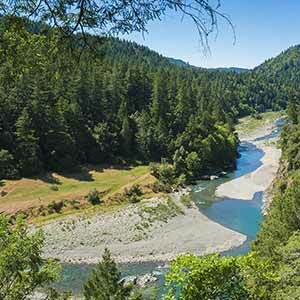 This superb hike around Upper Bull Creek Flat starts on the Homestead Trail, which runs along the edge of the flat through lush but relatively small redwoods, then returns through the center of the flat, through an outstanding lowland redwood grove. The Big Trees Area features the Giant Tree and the fallen Flatiron Tree. It doesn’t have the huge trees and the open, cathedral-like look of the Rockefeller or Homestead loops, but in some ways it’s more attractive. If you want to see big trees, this is a great place to do it. 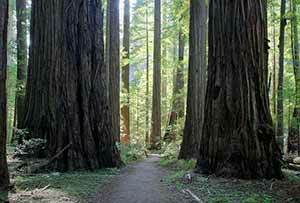 The trail passes through a very dense stand of large redwoods that grow on an alluvial flat alongside Bull Creek. The grove is not far from the Avenue of the Giants, yet traffic noise is minimal, so you can actually appreciate the serenity of the grove. 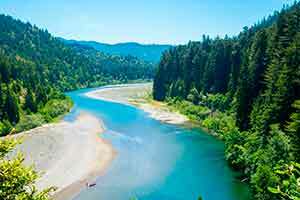 This grand tour of the Bull Creek lowlands loops between the sublime groves of Upper and Lower Bull Creek Flats, and is Humboldt Redwoods’ best long-distance hike. It can only be completed in the summer. 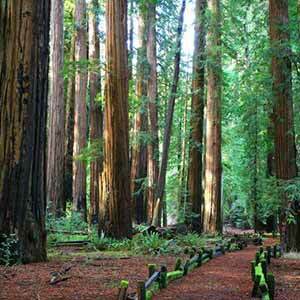 An extended version of the Rockefeller Loop walk that explores five old-growth redwood groves south of Bull Creek. Can only be hiked in the summer. This remote, little-visited road turns out to have a surprisingly nice old-growth Douglas fir and redwood grove. The area around the visitors’ center includes the very impressive Founders’ Grove and Canoe Creek areas, plus some smaller and less scenic groves. This is Humboldt Redwoods’ largest and most impressive grove and is by far the most popular attraction in the park, but it’s unfortunately filled with the constant roar of traffic from a 4-lane freeway that skirts the grove. 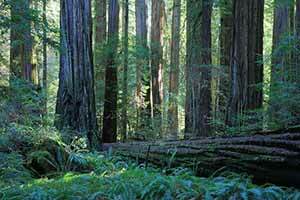 This fine grove is in a prime part of Humboldt Redwoods. It doesn’t have any trails to speak of, but you can take a short walk along the road to the parking lot. Located in a small patch of old growth just across from the visitors’ center, this short, level loop is nice but doesn’t have a whole lot of big trees. This loop passes through a thin strip of old growth next to the Avenue of the Giants. The trail starts in a heavily-logged area but then passes some big trees. The woods have a dry, scraggly appearance. 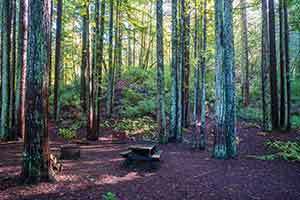 This new trail runs through mundane old growth uplands on the west side of the Eel River. It replaces an old trail through the spectacular Canoe Creek lowlands that’s unfortunately no longer accessible. Summer only. Between Phillipsville and Miranda are a few scattered old-growth groves. This short, level loop trail winds through the southernmost of the really impressive alluvial-flat lowland groves along the Avenue of the Giants. 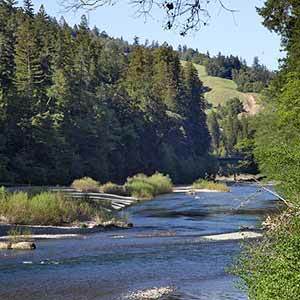 This trail crosses the Eel River and then runs along the river a short distance to reach an isolated old-growth grove. Summer only. This little grove has an impressive collection of perhaps half a dozen huge trees right next to the Avenue of the Giants. Easy access to the big trees makes this one of the more popular groves. 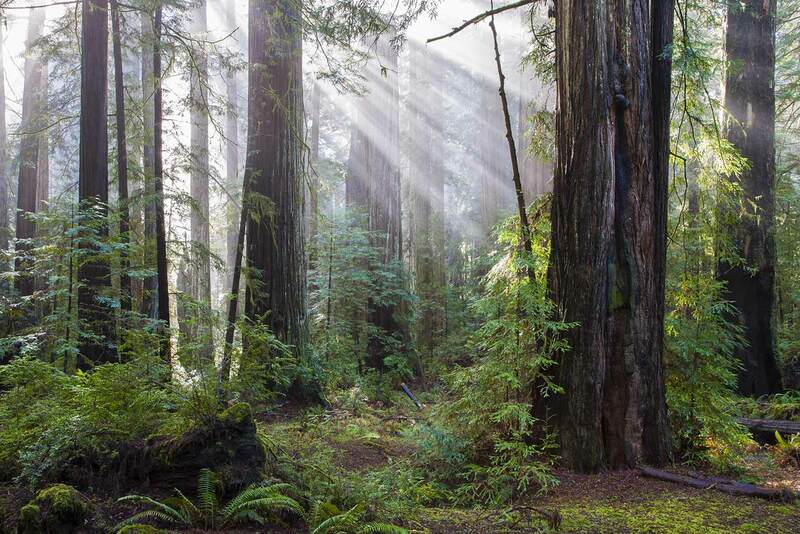 Humboldt Redwoods’ southernmost redwood grove is surprisingly lush. There are a few big redwoods near the beginning of the loop, but most of the other trees here are small and embedded in a dense understory. Starting on an old alignment of the Avenue of the Giants, this loop leads through a small lowland redwood grove to a gravelly beach on the Eel River. This trail starts in the impressive Jensen Grove, but quickly climbs into rather mundane upland redwoods before descending back to the Avenue of the Giants. This hike climbs the somewhat dull Grasshopper Multi Use Trail to the top of Grasshopper Mountain, then returns by way of the Johnson Camp Trail and an exceptionally scenic grove of upland redwoods. This is the longest and most challenging route to the top of Grasshopper Mountain. 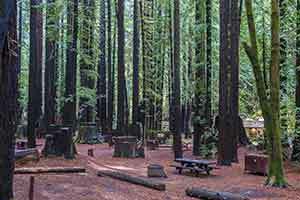 There are four trail camps on the way but only one brief stretch of big redwoods. This long climb up the east side of Grasshopper Mountain starts from the Visitors’ Center. Summer only. This long loop through Humboldt Redwoods’ backcountry is mostly pleasant if unspectacular non-redwood forest. 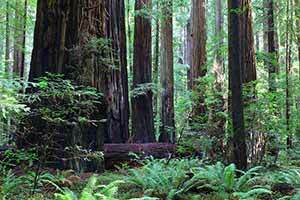 However, it also includes about four miles of old-growth redwoods, including a remote and very attractive ridgetop grove. This trail starts in Bull Creek Flats but almost immediately leaves the huge redwoods behind, instead climbing through a bright upland canyon populated with small redwoods. The trail ends at a 19th-century gravesite. 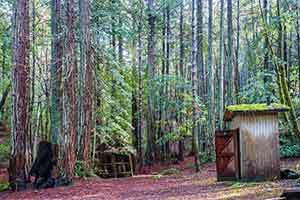 This small, quiet campground in Humboldt Redwoods is way out on Mattole Road just past the end of the old-growth redwoods. 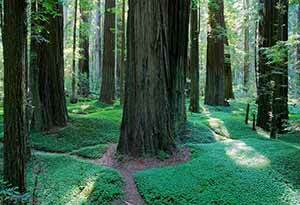 It’s mostly in the deep shade of small second-growth redwoods, but a few sites are at the edge of a sunny meadow. 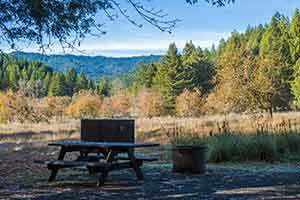 Hidden Springs is a large, sprawling suburb of a campground: it’s very spread out and offers lots of privacy, but it’s not centrally located so you have to drive to visit the redwood groves. 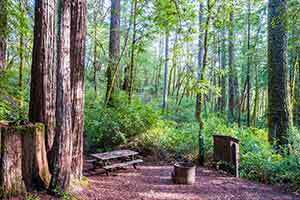 Burlington is clean, well-maintained, and in a convenient location, but it gets a lot of traffic noise and isn’t as attractive as the other Humboldt Redwoods campgrounds. There’s no cell phone coverage in the main body and north end of the park, even in the towns; only the south end (Miranda and Phillipsville) has cell phone coverage. So it’s not possible to use websites like Google Maps in the park. 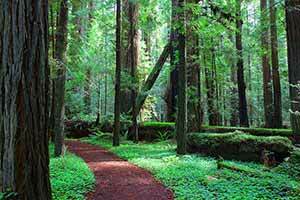 The trail maps on this website are based on the trail map of Humboldt Redwoods State Park from Redwood Hikes Press. This is the most detailed map of the park and is printed on waterproof plastic. Scale 1:25,000, 39 x 26 inches, 2017. $10.95 + tax and shipping if ordered from Redwood Hikes Press. 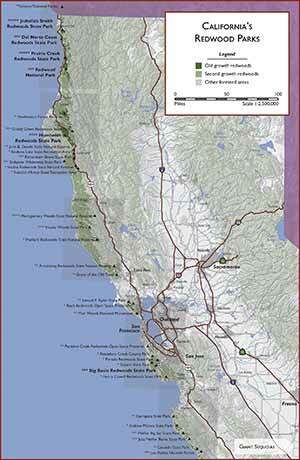 The Humboldt Redwoods Interpretive Association has a map that can be purchased at the visitor center. 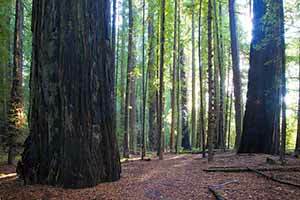 An online version can be seen at the Humboldt Redwoods Interpretive Association website. Scale 1:42,000, 25.5 x 22 inches. $4.00 + tax. The park brochure is available for free at the visitor center. Scale 1:42,000, 17 x 20.75 inches, 2014. Free.